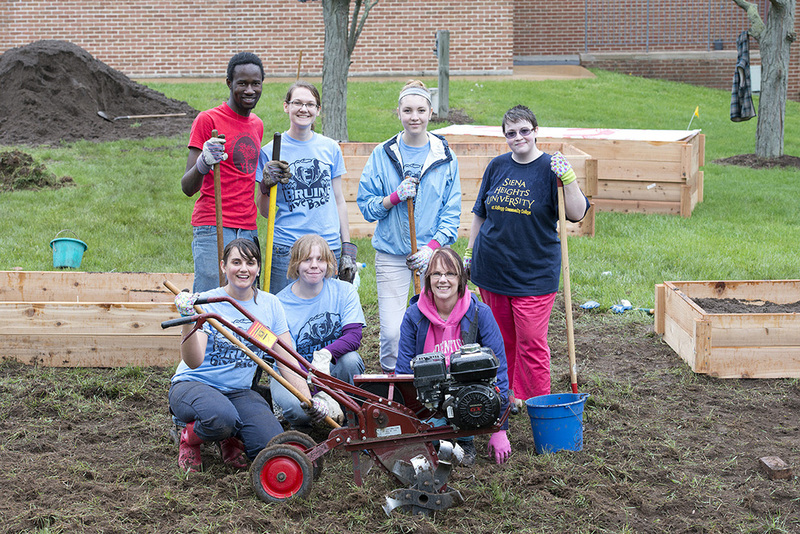 Thanks to a dedicated group of volunteers, the construction of the YES-KCC Community Garden at Kellogg Community College is now complete! To maintain the garden through the summer, Campus Gardening Days for KCC students and employees who want to work in the garden will be held from 11:30 a.m. to 1 p.m. Tuesdays and Wednesdays, while Community Work Days open to anyone interested in volunteering at the garden will be held from 11 a.m. to 2 p.m. Thursdays. The College is also introducing Adopt a Water or Weeding Day for KCC employees, through which an individual or entire department can sign up in the Service-Learning office to water or weed the garden on a day of their choice. For more information, contact Service-Learning Manager Kate DeGraaf at 269-965-3931 ext. 2211 or Service-Learning student workers Heather or Kerry at ext. 2618. Click here to read more about the garden in a post on this blog.